New research from New York University’s Furman Center [PDF] provides added evidence that New York’s parking minimums are forcing developers to provide unwanted automobile infrastructure, leading to less development, higher housing costs and more traffic. The new study expands on previous research from the Furman Center, extending the analysis from Queens to the other four boroughs and looking more closely at the process by which developers of smaller projects are exempted from parking requirements. The results show conclusively that parking minimums greatly distort the number of spaces built from what the market demands. Looking at every market-rate, residential development built between 2000 and 2008, the Furman researchers found 1,003 with more than five units (smaller projects are eligible for a waiver from the city’s parking minimums). Of those, 68 percent leapt at the opportunity to avoid the mandated construction of parking, taking advantage of another waiver based on lot size. Most of those developers didn’t just want to build less parking, they wanted to build no parking at all. 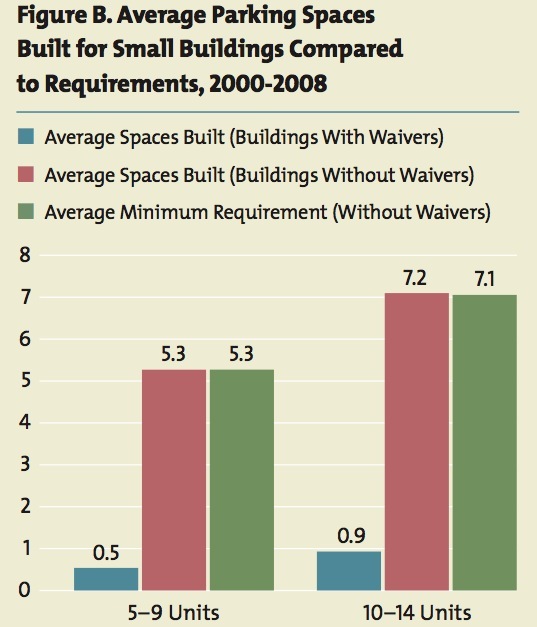 Only 17 percent of those who took a waiver built a single parking space. Where developers couldn’t get out of parking minimums, most built only what the city demanded of them. Over three-quarters of projects subject to parking minimums built either exactly the number of spaces required or a tiny number more. Whatever your opinion of parking minimums, it’s clear that they’re doing their job: forcing developers to provide parking, even if no one wants it. In one East New York project targeted at families making less than $44,000 a year, parking requirements forced Dunn Developments to build 18 parking spaces for the project’s 43 units. Only nine of the spaces are rented out. That means higher costs for all the residents. At its Navy Green project, Dunn won a mayoral override of parking minimums in order to keep rents affordable and a playground on site. Calculating the true parking minimums for New York City is a difficult exercise, due to the multiple ways developers can avoid the requirement, so the Furman Center’s new estimates of effective parking minimums in each borough is valuable. Given current lot sizes, the researchers estimate, 43 parking spaces are required for every 100 market rate housing units built citywide. 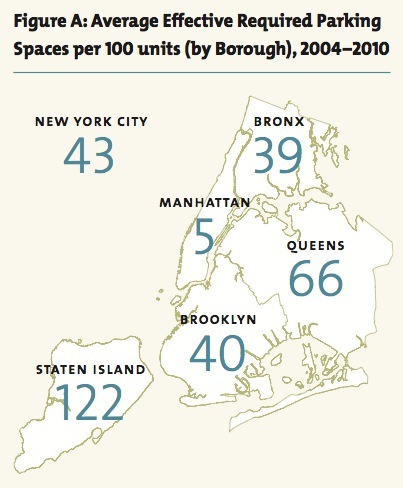 Almost no parking spaces are effectively required in Manhattan — though where big lots were built uptown to satisfy parking minimums, they’ve been urban design disasters — but 66 spaces are needed for every 100 units in Queens and 122 for every 100 residences on Staten Island. Those figures don’t account for the possibility of land owners subdividing their lots into pieces small enough to get around parking minimums, but as the authors point out, that itself is a costly distortion of the housing market. “Developers may reconfigure zoning lots to smaller sizes or unusual shapes to avoid parking requirements, and may then be unable to build the same number of housing units on the reconfigured lot than they would be allowed on the original lot,” says the report. Architect Richard Ferrara and developer Alan Bell have each told Streetsblog that they have subdivided projects, at a cost of either capital or housing units, all in order to avoid parking minimums. Echoing previous research from the Furman Center, this report finds that parking minimums are lower, though still high, near subway and commuter rail lines. Because those areas are often zoned to allow higher density, however, they actually end up having more parking in an absolute sense. The Furman Center report doesn’t take a normative position on whether the costs of parking minimums — less housing at higher costs, increased traffic and pollution — outweigh the benefit of protecting incumbent drivers from competition for existing parking spaces. But it lays out in no uncertain terms that those are the stakes: some of New York’s most pressing issues like affordable housing and environmental sustainability versus keeping parking cheap. As the Department of City Planning moves forward with reforms of parking minimums in the city’s “inner ring” of neighborhoods, it is pursuing a political strategy: moving quickly in Downtown Brooklyn, where developers strongly desire to eliminate the minimums, and proceeding elsewhere only as politically palatable. The Furman study should, hopefully, show politicians and communities just how costly their defense of parking minimums really is. This is a great study. However, the city and most developers already seem to be on board with this idea. The problem seems to be local communities who are convinced that every new renter or owner will bring a new car to the neighborhood, filling up all the on-street spaces, regardless of how full they are at present. Someone needs to debunk this myth if we are ever going to actually stop building unnecessary parking. Did anyone notice that repulsive CapitalOne bank that went up on Metropolitan Avenue in Williamsburg? Ugh. The off-street parking required by parking minimums might not have been such a bad thing if you simultaneously forbid curbside parking. Besides increasing lines of sight at intersections, the extra space could find many other uses besides car storage (bike lanes, sidewalk extensions, space for vendors, etc.). At the very least, the streets would look much nicer. Those rows of parked cars are real eyesores. J nailed it. Incumbent property owners are afraid of competition for free curbside parking and congestion. Ironically, we see local groups demand more parking as a solution which increases the number of vehicles in the neighborhood and drives up the cost of housing. I’m waiting for a courageous CB member or City Council member to stand up and tell a bunch of angry baby boomers that more parking = more cars and more expensive housing. @2555783a6f62598b6aadd2d882a4830f:disqus Be careful what you wish for. Lots of off-street parking means lots of driveways and curb cuts. Basically, this is what happened in San Francisco, and they have a much poorer pedestrian environment (more cars crossing and stopping on the sidewalk) and a harder time installing high-quality cycle tracks because of it (again, more locations of conflicts). Also, it is good to keep in mind that NYC banned overnight parking until the late 1940s, causing the construction of many parking garages, and the destruction of the buildings that they replaced. On-street parking may not be my favorite thing in the world, but it does do several beneficial things, including providing revenue for the city, a buffer between car traffic and sidewalks/cycle tracks, and some auto access for residences and stores. Dan and J, can’t they just give 10-year parking permits to local NIMBYs? Just something that guarantees them the same access to parking they have now. It might make them more comfortable with new projects without so much parking. As noted, the likely response of “real New Yorkers” — those who would prefer life in Houston but happened to be born here — to any opening of the parking issue would be a demand to do something about the waiver. The only way around this is permit parking on the street, with those currently licensed and insured in an area allowed to renew indefinately at a minimal cost, the total amount of permits fixed in areas where parking has been in a shortage, and new parkers forced to bid for any spaces that become available as others give them up. With all the parking revenues kept local through some kind of BID like special district. And Manhattan is proof that the market is fine at determining how much parking is necessary, every time I’ve gone there, there is a parking garage with open space from which I can walk or take a cab to my destination.